Astronomers have made the first tentative observations of a long-speculated, but never before detected, source of natural radio waves in interstellar space. Data from the National Science Foundation's 140 Foot Radio Telescope at the National Radio Astronomy Observatory in Green Bank, W.Va., show the faint, tell-tale signals of what appear to be dust grains spinning billions of times each second. This discovery eventually could yield a powerful new tool for understanding the interstellar medium - the immense clouds of gas and dust that populate interstellar space. "What we believe we have found," said Douglas P. Finkbeiner of Princeton University's Department of Astrophysics, "is the first hard evidence for electric dipole emission from rapidly rotating dust grains. If our studies are confirmed, it will be the first new source of continuum emission to be conclusively identified in the interstellar medium in nearly the past 20 years." Finkbeiner believes that these emissions have the potential in the future of revealing new and exciting information about the interstellar medium; they also may help to refine future studies of the Cosmic Microwave Background Radiation. The results from this study, which took place in spring 1999, were accepted for publication in Astrophysical Journal. Other contributors to this paper include David J. Schlegel, department of astrophysics, Princeton University; Curtis Frank, department of astronomy, University of Maryland; and Carl Heiles, department of astronomy, University of California at Berkeley. "The idea of dust grains emitting radiation by rotating is not new," comments Finkbeiner, "but to date it has been somewhat speculative." Scientists first proposed in 1957 that dust grains could emit radio signals, if they were caused to rotate rapidly enough. It was believed, however, that these radio emissions would be negligibly small - too weak to be of any impact to current radio astronomy research, and the idea was largely forgotten. In the 1990s this perception began to change when scientists and engineers designed sensitive instruments to detect the faint afterglow of the Big Bang, which is seen in the Universe as the Cosmic Microwave Background Radiation. While making detailed maps of this faint and cold radiation, scientists also detected signals at approximately the same wavelength and intensity as the background radiation, but clearly emanating from within the Milky Way's galactic plane. The researchers expected to detect some emission from the Milky Way, but what they encountered was much brighter than anticipated. This discovery caused some concern among researchers because of the need to have a very clear "window" on the Universe to study the background radiation in great detail. If there were a source of radio emission in our own galactic "back yard," then studies of the microwave background radiation would need to recognize these emissions and correct for them. "We want to be clear, however, that nothing we have found invalidates the current interpretation of the Cosmic Microwave Background Radiation," assured Finkbeiner. "Nobody has done anything wrong in neglecting these signals - so far." Scientists considered several plausible mechanisms for this anomalous emission, but these theories failed to explain the observed spatial distribution of this emission across the sky. This predicament prompted theorists to rethink the spinning dust idea, leading to a 1998 model by Bruce Draine (Princeton University) and Alex Lazarian (University of Wisconsin), which proposed rotational dust-grain emission as an important mechanism. Draine and Lazarian assumed that small dust grains, perhaps having no more than 100 atoms each, would populate many interstellar dust clouds in the Galaxy. Each grain would have a small electric dipole and would therefore react to the charged ions that race through the clouds at tremendous speeds. As an ion either strikes or passes near a dust grains, the grain would "spin up," reaching speeds of up to one trillion revolutions per minute, causing it to radiate. The rate of rotation of these dust grains directly correlates to the frequencies at which they radiate. For example, a dust grain rotating 10 billion times each second would emit radio waves at 10 gigahertz (GHz). In looking for this elusive signal, the researchers narrowed their search to 10 dust clouds within the Milky Way Galaxy. These specific clouds were selected because their location and properties would help to eliminate other possibilities for these emissions. "Our goal was to find those areas within the Milky Way Galaxy that would help us rule out other sources of emission," said Finkbeiner. "By selected these specific targets, we believe that the signals we received are very indicative of rapidly rotating dust grains." The researchers emphasize, however, that additional observations will be required to confirm their results, and other potential emission mechanisms have not been ruled out. Particularly, it is possible that a portion of this radiation is due to the presence of ferro-magnetic minerals within the dust grains. Additional studies with more sensitive equipment will be necessary to confirm these results conclusively. "What we think is the most intriguing, however," said Finkbeiner, "is that with further advances in radio astronomy, the faint emissions from rotating dust grains may reveal previously unknown details about the dynamics of the interstellar medium. By detecting and understanding this emission we also hope to give astronomers a tool to greatly refine future studies of the Cosmic Microwave Background Radiation." 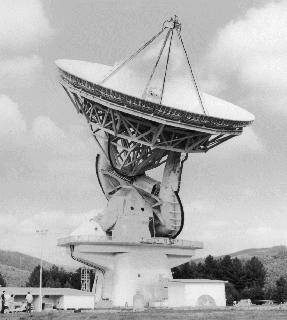 The NSF's 140 Foot Radio Telescope now is decommissioned after a long and highly productive career. Research will continue on the newly commissioned Robert C. Byrd Green Bank Telescope, which is the world's largest fully steerable radio telescope.